Dmrc lmrc nmrc metro exams syllabus paper pattern are same and here I am provide detail syllabus and paper pattern my previous post. This post help you reach direct to post. 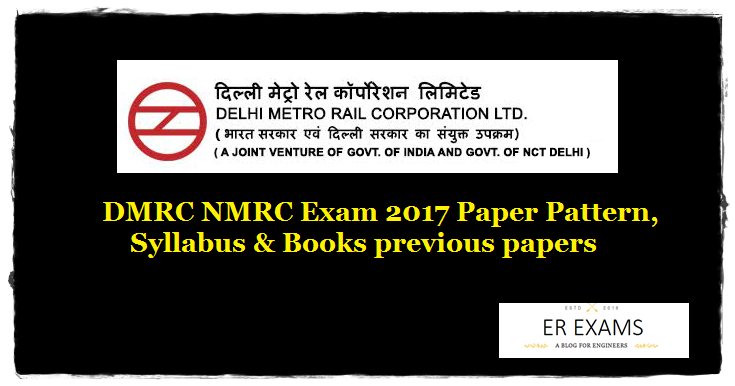 Delhi Metro Rail Corporation (DMRC) Limited publish notification for the recruitment of the following posts Dy. General Manager Design, General Manager Electrical, Manager Environment, Manager Design, Assistant Manager Finance, Assistant Manager Safety, Assistant Manager Civil, Assistant Manager Electrical, Chief Engineer Track, Junior Engineer/ Electrical, Junior Engineer/ Electronics, Junior Engineer/ Mechanical, Junior Engineer/ Civil, Legal officers, Station Controller/ Train Operator, Customer Relations Assistant, Office & Account Assistant, Stenographer and Maintainer vacancies on direct recruitment basis & contract basis as per their requirement.